It is not even a secret that as an organization, having a good plan and strategy in building business continuity and disaster recovery (BCDR) is critical. Speaking about strategy, it is also impossible to exclude cost matter. Having a good plan and strategy in BCDR could give organization assurance that data is safe, and applications and workloads keep running even if the unplanned outages occur. Talking about BCDR planning and strategy, like stated before, cost matter is one of the most matter in the topic. The cost needed to build a data center alone already using so much resource, imagine building two data center one as primary and one as the disaster recovery. In this case, also do not forget to include the maintenance for both data center. So, why not start to thinking about planning BCDR on cloud? The solution above is for enterprise scale. But do not worry Azure also provides the solution for SMB. Using cloud not only reduce time and cost in building BCDR but also serve organization a best practice incomplete solution. 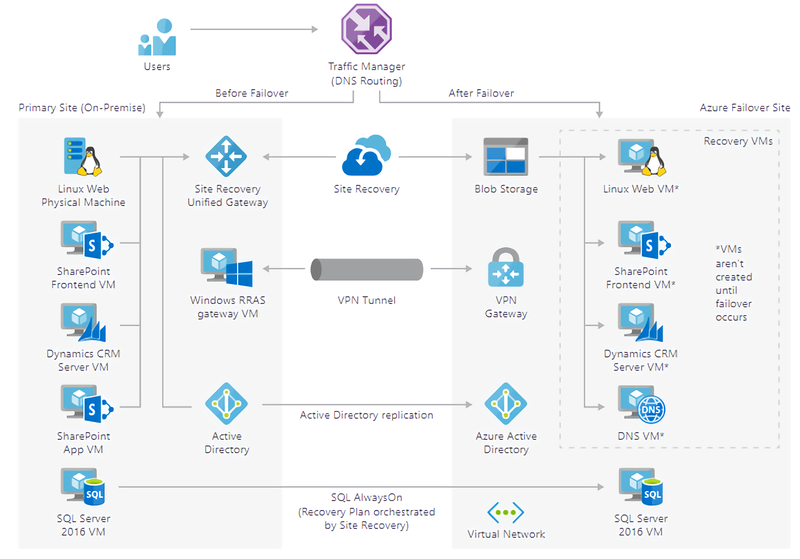 As in the solution above, we could see that it already includes Traffic Manager, Azure Site Recovery, Azure Active Directory, VPN Gateway, and Virtual Network. To sum it up, using cloud could check all the list you have in your planning and strategy to build a matured disaster recovery.